Café Ivéta will operate the restaurant in the Graduate Student Commons building at Quarry Plaza vacant since last June. Opening is expecting in mid-February. 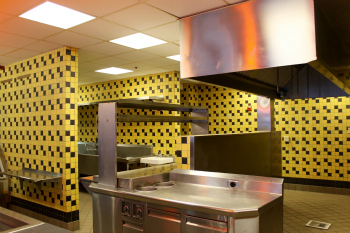 The yellow and black tile work in the restaurant kitchen has been resurfaced, becoming glossy white. Additional remodeling will create a new interior look. Renovations of the space formerly occupied by Joe’s Pizza and Subs have begun and new equipment is on order. Opening is anticipated in mid-February, said Ivéta owner John Bilanko. The menu will feature fresh, organic ingredients. “The whole goal is to keep it fresh, keep it simple, and keep it fast,” Bilanko said. Menu items will include eggs, freshly baked pastries, homemade soups, salad bar, fish tacos, free-range chicken and turkey, and grass-fed beef. The café will feature a full espresso bar and sustainable coffee, also craft beers and wine. The campus café will be open Monday through Friday from 9 a.m. to 10 p.m. and feature breakfast, lunch, and dinner. Saturday hours will be 10 a.m. to 4 p.m. The café will be initially closed Sundays, Bilanko said. Café Ivéta and the Graduate Student Commons have signed a 4 1/2-year lease. The GSC’s goal is to have the restaurant be more sustainable, by reducing green house gas emissions with new energy-efficient commercial appliances and new LED lighting with daylight harvesting sensors, said Rachel Neuman, GSC business and building manager. The UCSC Carbon Fund Committee has awarded the GSC $25,000 toward new energy efficient equipment and the GSC is applying for additional grants from the Carbon Fund Grant and the Student Fee Advisory Committee to help cover lighting costs and additional cost for energy-efficient appliances. “We expect to exceed the university’s sustainability goals right from the get go,” Bilanko said. He also hopes to source campus-grown produce from the university farm. Neuman said the kitchen will have a new look and feel. The existing yellow and black tiles were refinished and are now white. Plans are in place to design and install new cabinetry. “It's our hope to provide a nice, clean and comfortable look that ties in nicely with Café Ivéta's theme,” she said. John and Yvette Bilanko first opened Yvette’s Espresso Bar in 1991 in Barrington, Ill., a Chicago suburb. They also developed a wholesale business manufacturing and distributing scone, muffin, and biscuit mixes. 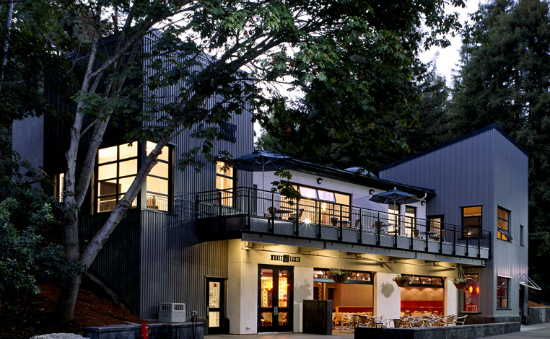 In 1998, with two daughters attending UC Santa Cruz, they sold the café, kept the wholesale business, and moved to Santa Cruz. In 2010, they opened Café Ivéta on Delaware Avenue where they continue making and distributing artisan baking mixes and also operate a catering business. Bilanko said he wants the campus café to be “like what we do at our other place, be welcoming to the community.” His youngest daughter, Danielle, will manage the café, and they expect to hire up to 25 part-time student employees. Neuman thanked the many university units that have come together to create the new restaurant. 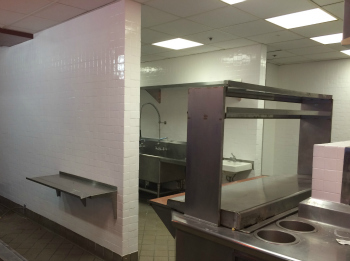 “It's been extremely rewarding to see the GSC kitchen retrofit projects moving along seamlessly while working with incredible colleagues across the campus,” she said, calling out the real estate office, procurement office, GSC committee members who served on the restaurant selection committee, project manager Joshua Francis in Physical Planning and Construction, and numerous staff in Physical Plant who have supported the project.